When Laura Dobi, founder of Green Revolution Skin Studio in Bethesda, Maryland (locals, take note! ), reached out to me about swinging by her studio for an organic facial, I was turnt up about it. I’d never had a facial of any kind before (real talk), and Laura has serious green skin credentials and expertise, so I knew it wouldn’t disappoint. What I didn’t expect was for my appointment with Laura to catalyze a whole new chapter in my skin’s history (!). Truly, no product or experience I’ve had since starting this blog has been as impactful on me or the state of my skin than my facial at Green Revolution Skin Studio. Seriously. Her studio is so aptly named! My skin is clearer than it has been in well over a year. After months and months of tirelessly swapping in an endless assortment of products, diet adjustments and supplements (to no avail), Laura gave my skin the reset and supplemental regimen it needed. Thank you, Laura! If you’re stuck in a skincare rut, or haven’t been able to self-solve your skin issues, consider investing in a green/organic facial or consulting with a pro. With Laura, if you can! I was so stubborn and resolute in trying to clear my skin for over a year. I would have visited Laura much sooner if I’d known I’d have such amazing results. SO: what can you expect from a treatment with this miracle worker? 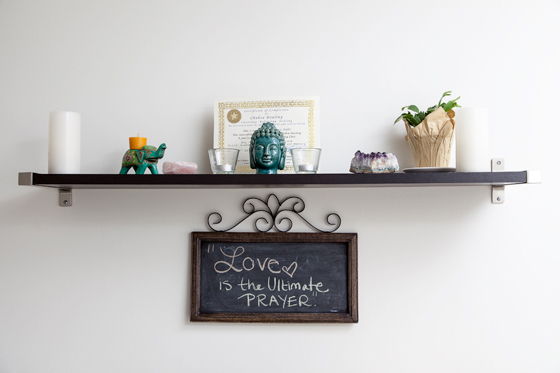 First off, Laura’s studio is beautiful, calming and quaint. It’s built to accommodate a single client at a time, so you get her full attention and don’t feel like you’re in a skincare factory with bathrobe-clad strangers milling around everywhere. Laura’s energy matches that of her studio: she is so kind, positive and genuine. An appointment with her is not just a facial. It’s a complete mind-body experience. And it. Is. Awesome. Laura’s facials are customized to your skin type and she’ll select products and procedures according to your specific skin challenges and concerns. She’s drawing on a seriously well-versed education in skincare: she knows her way around a facial and is extremely knowledgable on products, ingredients and WHY they work (as well as what doesn’t). She uses a wide variety of organic/green-leaning products including Suki, SIRCUIT, the Body Deli, and more.